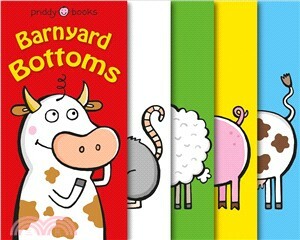 Help Cow find his mom in this humorous novelty board book, featuring four pull-tabs revealing hidden barnyard animals. Toddlers will love Barnyard Bottoms—a seek-and-find romp around the farm with four fun pull-tabs! Join Cow as he searches around the barnyard for his mom, muddling up different animals along the way. The fun rhyming text encourages young children to ask questions and participate in the story as they try to work out which animal it is. "Is that my mom? She's brown and white." "No that's a hen! That's not right." With its bright, characterful illustrations, parents and children alike will enjoy this hilarious novelty board book.